Declared Accuracy*: The table below shows Arms values measured using the Model 9591 in non-motion conditions. 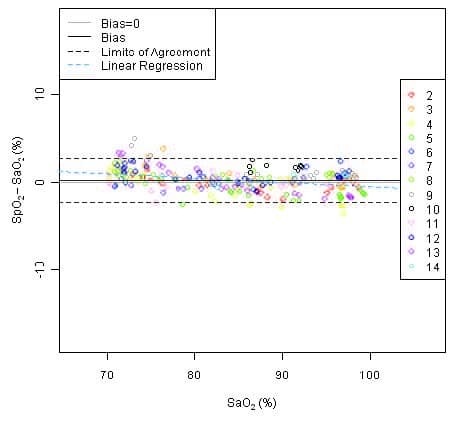 This graph shows plots of the error (SpO2 – SaO2) by SaO2 using the Model 9591 with a linear regression fit and upper 95% and lower 95% limits of agreement. Each sample data point is identified by subject from a clinical study in non-motion. Operating: Approximately 2,000 spot checks, or 25 hours of continuous operation using new alkaline batteries. device will be stored for more than 30 days. This product complies with RoHS. This product complies with REACH. * ±1 Arms represents approximately 68% of measurements.